Hi guys! I know I'm a little early, but tonight I've got the April PPU shade from Noodles Nail Polish to show you. Not sure what PPU is? Each month, indie makers come together to bring store a exclusive nail polish or other handmade good for just 4 days a month (first Friday-Monday). The themes change each month and are chosen by the people. Each brand uses their own inspiration to come up with new and exciting items. Shipping is just $3 for the US, $5 for Canada, and more for international customers. A UK site recently opened, so you can purchase there if you are in Europe. If you make several orders over the weekend, all will be combined and shipping overages will be refunded (make sure to have the same name and address associated with each order). This month's theme was Famous Works of Art and Noodles Nail Polish was inspired by the mosaic piece of art, Depthfinder by Sonia King. I happen to love mosaics...just look at that piece above! PPU opens at 11:00 AM ET on April 5th, and closes at 11:59 PM on Monday, April 8th. 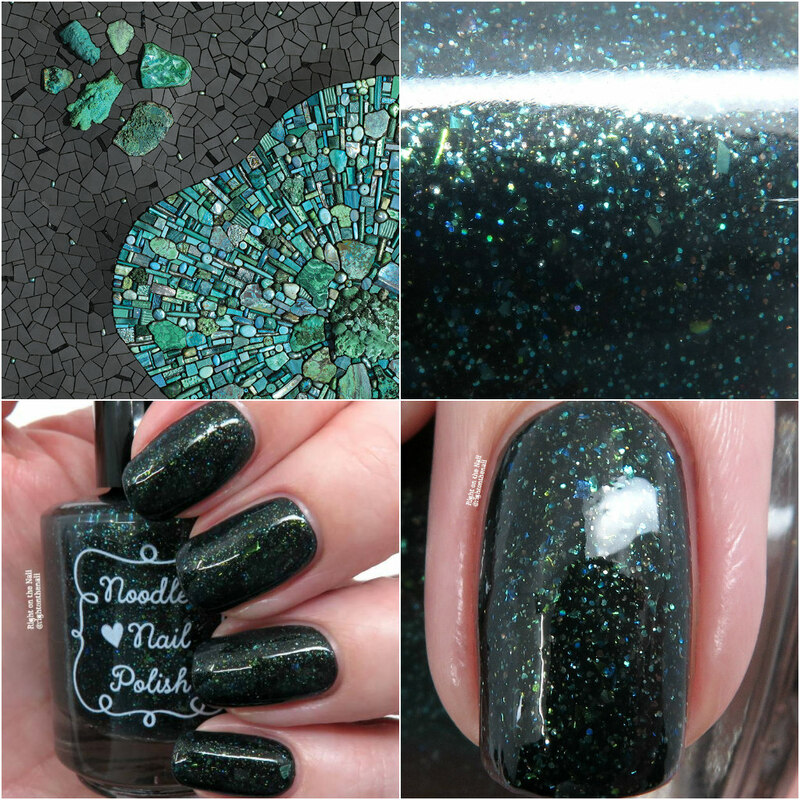 Depthfinder is a dark charcoal crelly base with green/blue UCC flakes, blue/green shifting shimmer, and turquoise/aqua microglitter. Even though the base is dark, the amount of flakes/glitter in here makes it almost appear to have a green base. It's amazing how well the polish matches the mosaic piece. The polish was extremely pigmented was nearly a 1-coater. As always, I used 2 for my photos above, and it applied flawlessly like all my Noodles. It dried with some texture due to the glitters, so make sure to use a thick topcoat to smooth everything out, or add a second coat of thin ones. Blue and green polishes are some of my favorites, so it's no surprise I enjoyed this one so much. Natalie is so good at balancing out flakes with glitter. You can find out more about Noodles Nail Polish on their website, Instagram page, Facebook page, and Facebook Fan Group while you can learn more about PPU on their Facebook page and website. Have a great night! Gorgeous swatches! Love the flakes in there. Thank you so much! It's definitely a gorgeous combo of glitter and flakes.